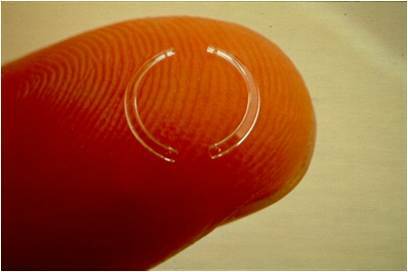 Intacs are implantable intracorneal ring segments (also known as ICRS or corneal rings). This is a technique which may be helpful for patients with keratoconus or corneal optical irregularities such as ectasia after other surgeries. Originally FDA-approved in 1998 to correct nearsightedness, Intacs were approved in 2004 by the FDA as a humanitarian device for the treatment of keratoconus. Results of Intacs for keratoconus treatment have been encouraging, especially in patients unable to tolerate contact lenses or in need of a corneal transplant. Here at the CLEI Center for Keratoconus, we have been working with Intacs for KC for many years. Our data analysis and research over the years has let us develop enhancements to the procedure. These include creating Intacs tunnel geometries designed to best reshape your cornea, use of different Intacs sizes and positioning techniques based on your corneal analysis, and use of corneal image cross-section analysis to help plan your procedure. This has led to improved outcomes over the years. In addition, we have clinical studies looking the combination of Intacs with collagen cros slinking. Intacs are two small crescents of a contact lens-like material (PMMA). The insertion of Intacs causes the cornea to generally flatten. Intacs also tend to decrease the irregular astigmatism and corneal asymmetries found in keratoconus. If necessary, Intacs can be safely removed and the cornea will generally return to its preoperative condition. 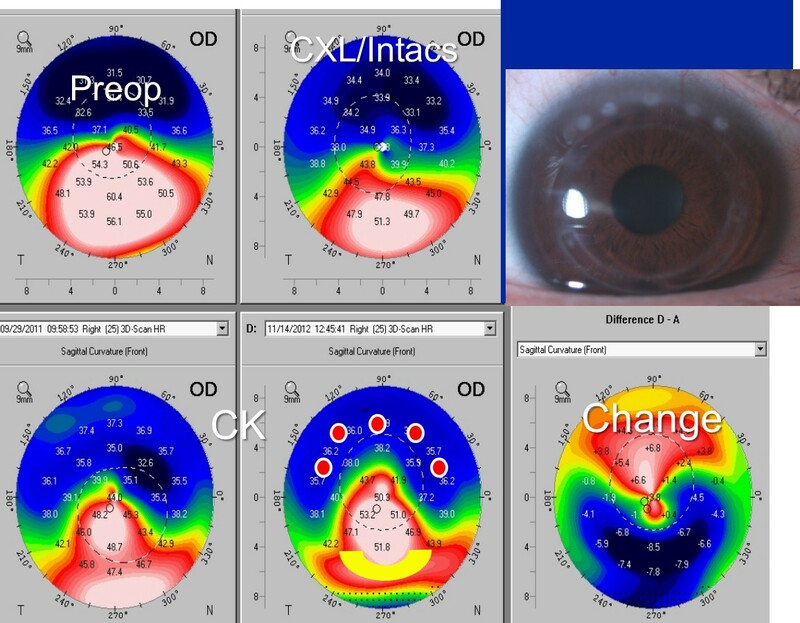 The primary goal of Intacs in keratoconus is to improve contact lens fitting, comfort, and corrected vision and to avoid corneal transplantation. Other goals are to improve vision with glasses as well as uncorrected vision (without glasses or contact lenses). Intacs can also be used after other keratoconus procedures, such as corneal collagen crosslinking. After your KC evaluation, Dr. Hersh will be able to discuss the goals of Intacs for you based on the severity of your problem. 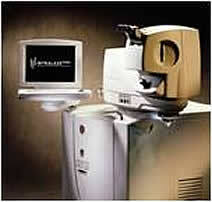 Intacs are performed at Dr. Hersh’s state of the art CLEI Center for Keratoconus as a same day procedure. At the beginning of the procedure, your eyes are numbed with anesthetic drops. A lid holder supports your lids to avoid blinking during the procedure. A thin channel within the cornea is then prepared, into which the Intacs will be inserted. This step is done with a high speed femtosecond laser called an Intralase. Next, the Intacs are inserted. 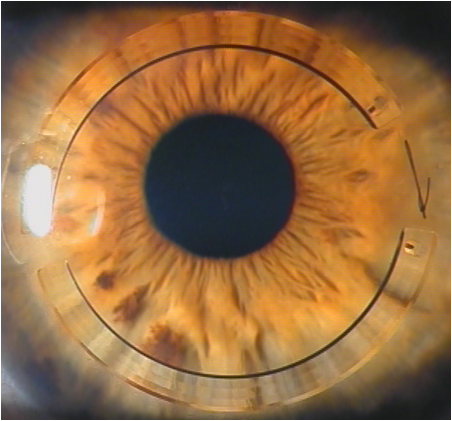 Some patients may have 2 Intacs placed, others will have Intacs of assymmetric sizes, and others may have only one placed depending on the individual cornea shape. Before your procedure, Dr. Hersh will decide on a surgical plan designed to give you optimal results. At the end of the procedure, a contact lens bandage is placed, eyedrops are given, and a clear plastic shield is applied for protection. Sometimes, one small suture is placed as well. You will use eyedrops to avoid infection and inflammation for 1-2 weeks. Vision begins to improve the day after the procedure but may fluctuate for several days. Most people can return to work one to two days after the procedure. During your followup examinations, we will determine if additional procedures may be beneficial. These include changing Intacs size or position, adding supplemental procedures such as Conductive Keratoplasty (CK), and other techniques. Keep in mind that Intacs is not necessarily a one-time procedure... further treatment might be necessary over the months after your surgery to enhance and optimize the final result. In brief, there are two basic types of possible side effects with Intacs. Because some patients respond and heal differently, results can vary. In most cases, although the cornea is improved, glasses or contacts will still be necessary. In addition, other optical side effects include haloes around lights and glare, especially at night. The other group of rarer complications may be secondary to problems with insertion of the Intacs, infection, or problems with corneal healing. In some cases, this will necessitate removal of the Intacs segments. We will discuss these possibilities in detail prior to your procedure. At the CLEI Center for Keratoconus, we are working on innovative approaches to treating keratoconus. We have found that, in some cases, Intacs can be combined with the Conductive Keratoplasty (CK) procedure either the same day or in multiple visits. CK is a collagen shrinkage procedure which can help reshape the cornea. In combination with Intacs, or performed after the Intacs suture is removed, CK may allow for better reshaping of the keratoconic cornea. In fact, we were the first to perform this combined procedure in the U.S. Although an FDA-approved procedure for the correction of farsightedness, it is important to know that CK for the treatment of keratoconus in not FDA-approved. However, it can be selected by the patient and doctor as an "off-label" procedure if appropriate. We will discuss this with you if we think you are a good candidate for Intacs/CK combined surgery.